How do I clean my Samsung French Door Refrigerator (RF23J9011SR)? Clean your refrigerator regularly to increase the performance and lifespan of your home appliance. Warning: Do not use benzene, thinner, home/car detergent, or Clorox to clean the refrigerator. They may damage the surface of the refrigerator and cause a fire. Important: Do not spray water onto the refrigerator. This may cause electric shock. Note: Regularly use a dry cloth to remove all foreign substances such as dust or water. 2. 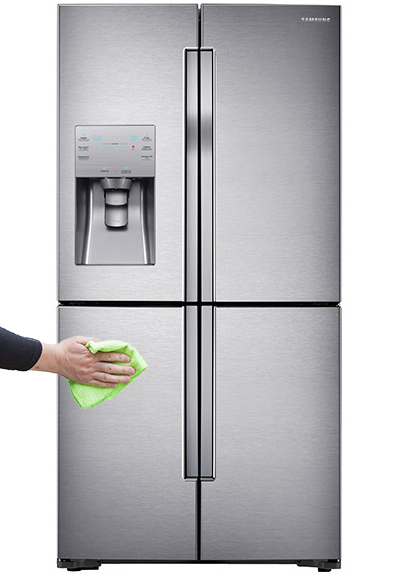 Use a moistened, soft, lint-free cloth or paper towel to clean the refrigerator’s interior and exterior. 3. When done, use a dry cloth or paper towel to dry well. When crushed ice is selected, some residual ice chips may collect in the ice chute. To prevent this, remove the residual ice from the chute using a soft, clean cloth. If the rubber seals of a door become dirty, the door may not close properly and reducing refrigerator performance and efficiency. Use a mild detergent and damp cloth to clean the rubber seals. Then, dry well with a cloth. 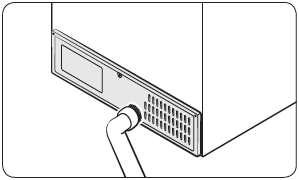 To keep cords and exposed parts of the rear panel free of dirt, vacuum the panel once or twice a year. Caution: Do not remove the rear panel cover. Electric shock may occur.